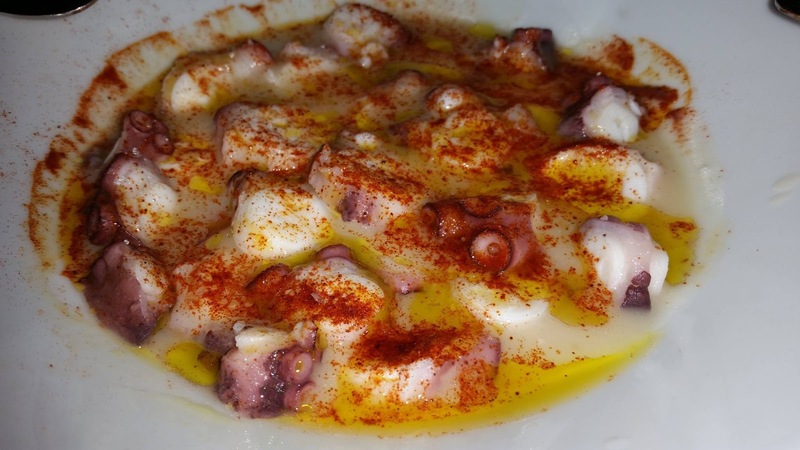 in the village at Vilanova de Arosa (Pontevedra) is dedicated to Galician women cooking octopus. Perhaps with the exception of lacón con grelos (a dish made with grelos, turnip or parsnip greens, pork shoulder, chorizo, potatoes and Spanish pimentón) and caldo gallego (a stew of pork, beef and or chicken with chorizo and/or bacon; turnip greens, collard greens or green cabbage; white beans and potatoes), pulpo a la gallega (polbo a la galega in Galcian) is the most ubiquitous dish in Galicia. Although it is a dish now served in many parts of Spain, the Gallegos never seem to get enough of it. Steamed polbo a la galega (pulpo a la gallega; octopus Gallician style) dressed with olive oil, Spanish pimentón (paprika) and sea salt, though now prohibited in some restaurants by the health authorities (Duh! The restaurants wash the plates in hot water like everything else), is best served on a wooden plate, which absorbs excess water. At Bar Pintos, Cambados (Pontevedra), Galicia. Octopus is usually frozen to tenderize it--sometimes it is pounded--then boiled until tender in a stock pot or, in Galician fiestas, in large metal kettles. The steamed octopus is then cut with kitchen shears with bit-sized pieces, placed on a plate (best on the now forbidden [in restaurants, at least] round wooden plates, as served at fiestas; the wooden plates absorb some of the water, instead of allowing it to pool up below the octopus as on a normal plate. After the octopus is plated, it is dressed with Spanish extra virgin olive oil, Spanish pimentón (paprika) and sea salt, speared with toothpicks and served with good Galician bread. Sometimes steamed potatoes, another adored Galician staple are served with the pulpo. polbo a la galega (pulpo a la gallega; octopus Galician style) dressed with olive oil, Spanish pimentón (paprika) and sea salt. It is claimed that the best octopus cooks are women from the inland towns of Carballiño and Ribadavia in the province of Ourense. Since the best polbo a la galega supposedly comes from frozen octopus, this is not as unreasonable as it sounds, even though these towns are at least an hour from the nearest seacoast. One Sunday morning in the center of Ribadavia, which has an exceptional old Jewish quarter (14th-16th centuries), I encountered a woman in front of a bar preparing polbo a la galega (see photos in slide show). Pulpo that has been steamed, at a restaurant in Ribadavia in the Ribeiro wine district. Another day, I was invited by my friend Manuel Formigo de la Fuente, who makes an exceptional Ribeiro wine in nearby Beade, to a special polbo a la galega day at a restaurant in Ribadavia. The was a wait to get into the restaurant even though this dish can be found in almost any tapas bar or traditional restaurant in Galicia on any given day. Finca Teira white wine, which will accompany the pulpo a la gallega that his mother prepared. A modern rendition of pulpo a la gallega, this poached octopus in a pure of potatoes with Spanish pimentón (paprika) and olive oil, at Ibiza Tapas, 93 Mill Plain Rd, Danbury, CT (203) 616-5731, October 23, 2015. Ibiza owner and native Gallego Ignacio Blanco is a veteran restaurateur from Galicia, who achieved three stars from the New York Times for his NYC restaurant Meigas, which closed after 9/11. Ignacio and his two chefs have developed a series of dishes that amount to some of the greatest Spanish tapas I have ever eaten in the United States. For young local chefs who want to learn about modernized traditional Spanish cuisine done by a real professional, if you can't get to Spain right now, get thyself to Danbury, Connecticut to this unassuming, but attractively decorated restaurant in an unprepossessing little shopping center on the Western edge of Danbury, just off Exit Two (Mill Plain Road/ Route 2012). Photo by Gerry Dawes©2015 / gerrydawes@aol.com / Facebook / Twitter / YouTube / Pinterest. Samsung Galaxy S5 Phone Camera 16MB.